Certainly it’s no longer a case of hiding their candle under a grapevine, because Exultet has won the Ontario Wine Awards’ Best Chardonnay Over $20 award for the last three years running. The wine the couple have named “The Blessed” must surely be just that, because the 2011 vintage recently won the Lieutenant Governor’s Award for Excellence in Ontario Wines. Exultet Estates is a rather grand name for a winery that makes a mere 1,000 cases of Chardonnay, Pinot Noir, Pinot Grigio and Vidal Icewine (one of the few producers of this dessert wine in The County). Unlike most of the new PEC wineries that operate out of refurbished barns, Exultet is housed in what used to be the Royal Street Cheese Factory which flourished in the 1870s in the hamlet of Milford, deep in the heart of Prince Edward County. Its vineyards were planted in 2004. This enterprise is one of many exciting new wineries that have sprung up in Prince Edward County in the last decade, making it the fastest-growing wine region in Canada. Currently there are some 30 wineries on the island with at least five more opening in the next two years. And this from a region that crushes only one per cent of the grapes grown in Ontario. While some PEC wineries “import” fruit from the Niagara Peninsula, those that use exclusively county-grown fruit account in total for some 80,000 cases — the scale of a single, mid-sized Niagara winery. Emerging wine regions need a destination winery to attract tourists, and that The County has in Huff Estates, the largest facility in PEC, producing around 1100 cases. (Huff’s winemaker, Frédéric Picard, made the first Champagne-method sparkler in The County which is rivalled only by the bubblies made by another of PEC’s tiny operations, Hinterland.) With its contemporary barn structure set above the cellars, its restaurant, convention centre inn, art gallery, sculpture garden and helipad, Huff Estates has become a magnet for wine tourists in the area. Their South Bay Chardonnay is also a consistent medal-winner. Ever mindful of the need to draw visitors to the region, savvy destination marketers have devised a Taste Trail that integrates winery visits with cheese producers, a craft brewery, restaurants , inns and a famous ice cream parlour. In addition they have also created an Arts Trail with prescribed routes that link the galleries and ateliers of local artists, artisans, photographers, sculptors and potters in a web of towns and hamlets. The Waring House Inn even has two artists-in-residence with studios on the property. 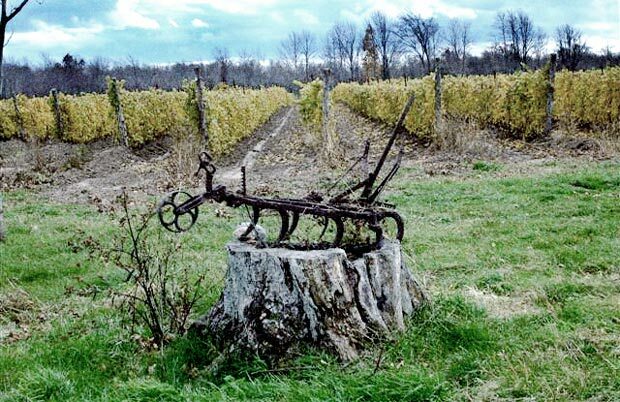 What the wine folk of Prince Edward County have managed to achieve in a few short years could be a template for any nascent wine region in the world when it comes to attracting potential consumers down to wine country.